SPECIAL PURCHASE! 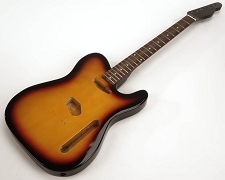 A MAJOR guitar factory was left with thousands of these- we had them finished off and will sell them to you at an unheard of price! 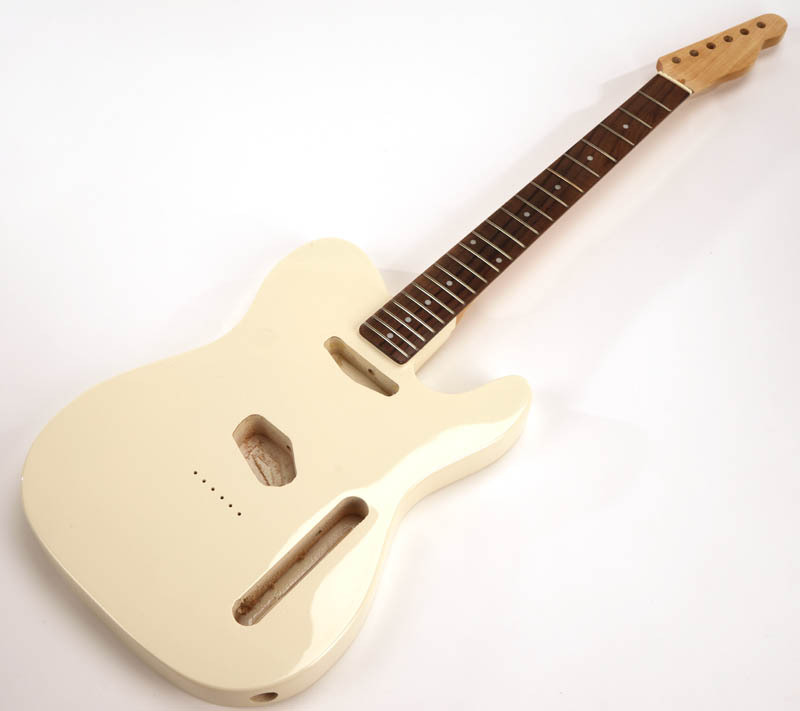 The Ultimate for Sustain, Tone and Upper Fret Access! 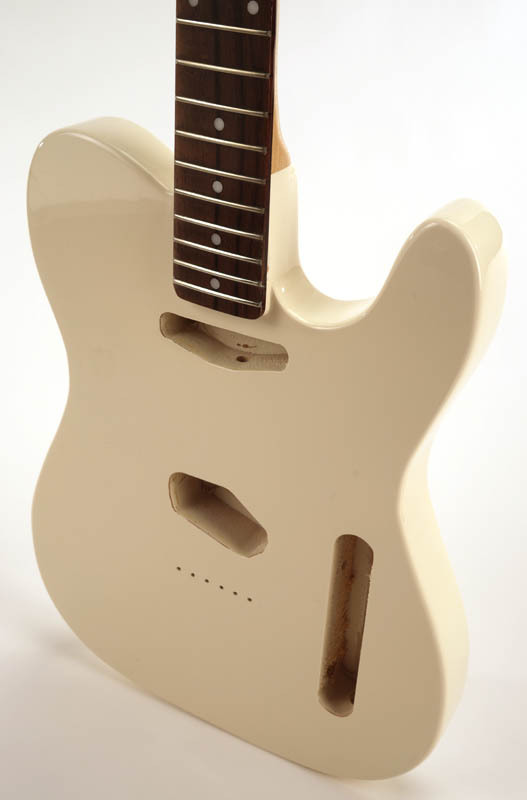 GLUED-IN setneck Tele style guitar. 21 medium jumbo frets. 12" radius with a medium "C" neck profile with just the hint of a deeper V. These are 43mm wide at the nut and 56mm wide at the heel. 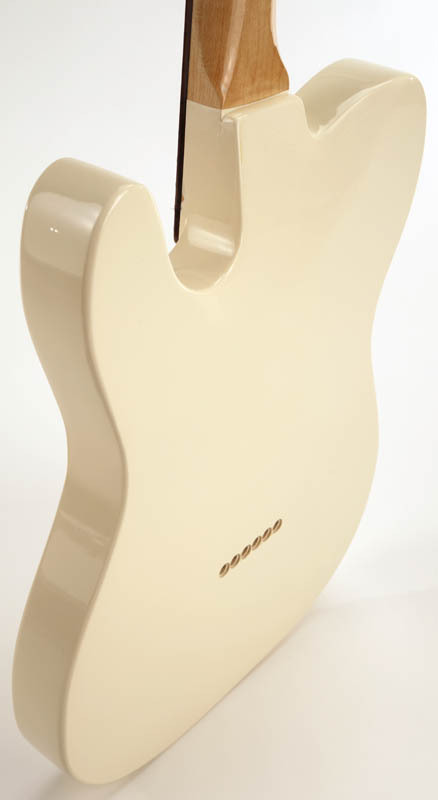 Super nice neck profile! Canadian HARD ROCK Maple neck with Rosewood fingerboard. Nice lightweight Pauwlonia body with clear white maple veneer. These are finished and buffed, ready for assembly. 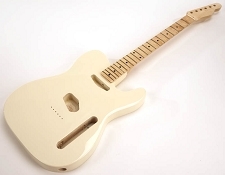 This version is the traditional Telecaster shaped-Style body. 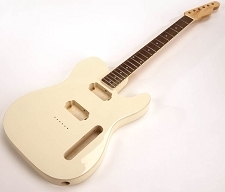 They are routed to accept standard vintage style bridge and neck pickups, traditional "ashtray" style bridge and traditional tele control plate. These are a full 43.5mm deep, with a nice carved area where the neck meets the body. 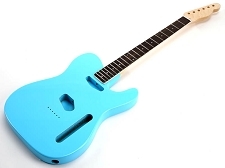 Upper fret access is tremendous! 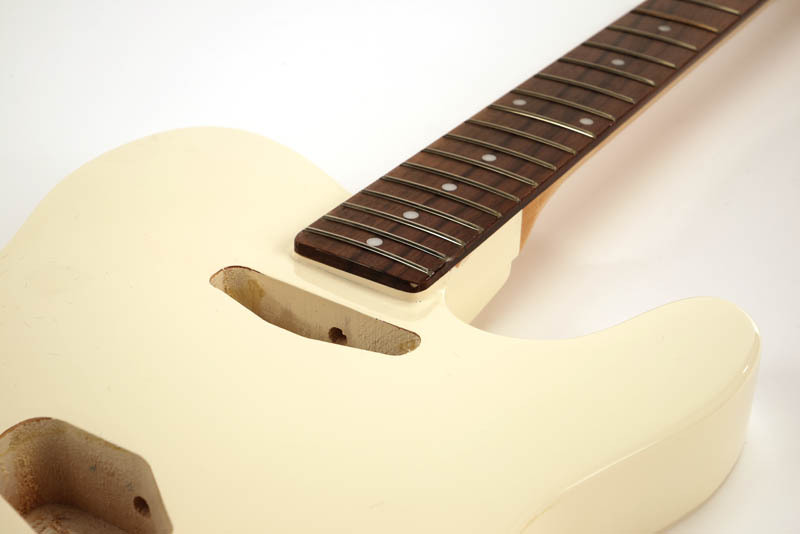 The pickups through-holes are drilled, the bridge holes are drilled and the rear ferrules holes are drilled. These take traditional ferrules- our part numbers K13, K14 or K15. The bridge is the traditional sized like our part numbers C09, C10 and C32 and their Wilkinson variants (And other traditional sized bridges). We strongly recommend doing a standard fret level, grind and polish on ANY brand new project. These are brand new, unused... but do expect just the smallest amount of finish issues with these- they have not yet been assembled and gone through the standard factory touch-up and buff process- YOU will have to do that. 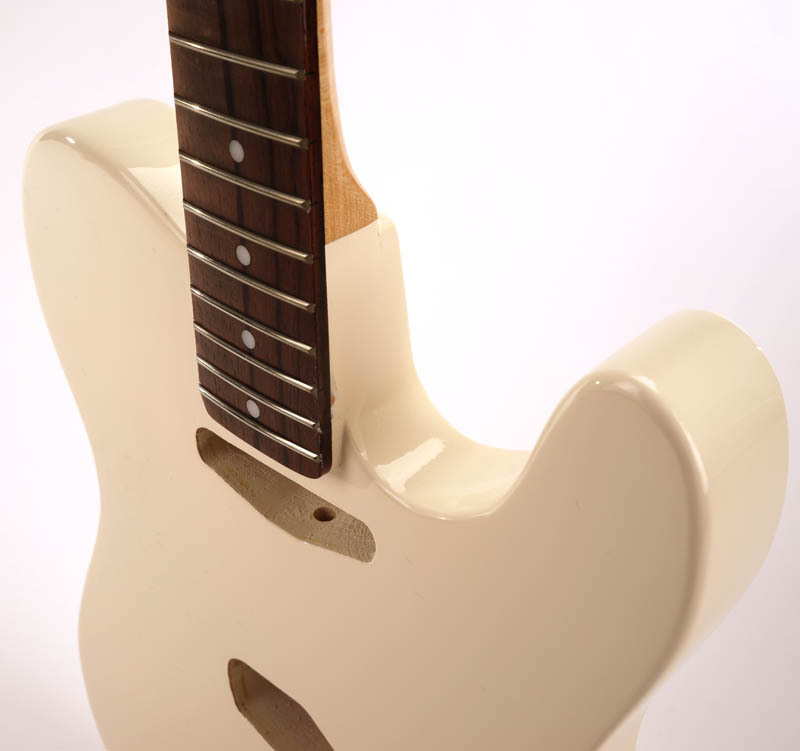 The Pauwlonia body meets the maple neck and is glued together- NO BOLTS. 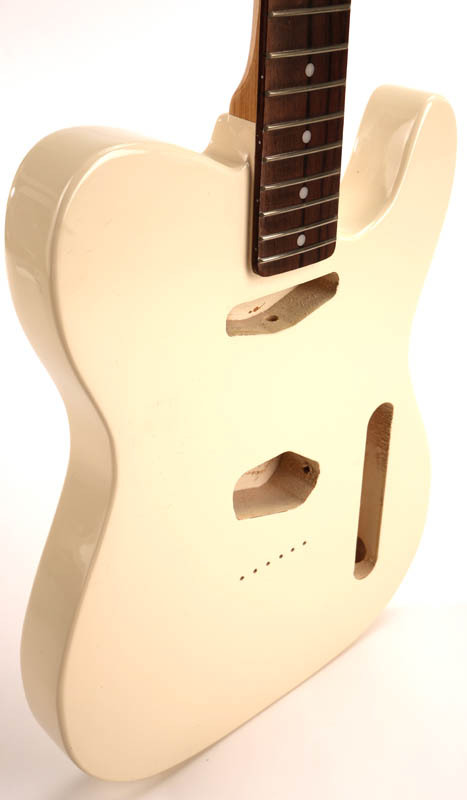 The super tight neck fit and internal tenon make for a terrifically strong necks joint. Due to the two different woods meeting- you'll find that the finish will eventually show "Witness Lines" at that seam. Does not mean the wood is cracked, just means they expand and contract at different rates. Average weight on these is around 6 lbs.